Following are the daily updates of my adventure as I attempted to hitch hike across America from Palm Beach on the East Coast to San Diego on the West Coast…. 418 miles, 4 hitches and no sexual favours! Day 1 was very surprising! Number 82- Hitch hike across America is off to flying start! Sarah was kind enough to drive me past her destination all the way to a rest area in order to give me the best chance of hitching my next lift. Some people are entirely selfless! 20 minutes after saying goodbye to Sarah, a white pick-up truck pulls up and asks if I need a ride. The driver is called Skip and he seems very friendly. A Vietnam War veteran, Skip shares some sad stories with me as we again head North towards the 10. He’s on his way to pick up his Mum in Georgia who at 88 years-old needs some extra help. Skip is clearly a good man. His long white pony tail which blows wildly as the wind from the open window fills the truck will soon be shaved off and donated to a Cancer related charity who create wigs from such donations. Skip then tells me of “Bikes for Tykes”; the charity that he created 22 years ago. Bike for Tykes restores old and broken bikes to almost-new conditions and then donates them to disadvantaged kids. It’s a passion that Skip’s father passed onto him and something that has now expanded to 5 countries outside of the USA! His motto is simple; A bike for every child! Make sure you check out the website! We soon reach the 10 and Skip lets me out. As he drives off I realise that I’m not near to any service stations or rest stops which I am quickly discovering to be the best areas to pick up rides. Instead I’m left to put my backpack on and start walking down the side of this huge highway. Skip and me on the ’10′- middle of nowhere! Half-heartedly I stick out my thumb as cars and trucks whizz past me at thousand miles an hour, but today is my day and within 2 minutes Jaasha and his VW Combi pulls over! Jaasha is on his way to a music festival but offers me a lift a short way along the 10 which runs East to West across America. This road will eventually complete my journey a further 2000 miles to the West. Jaasha tells me of his new focus on work and spirituality in his life as he dilutes darker habits of the past. He mentions an eccentric group of people called the Rainbow People whose aim it is to bring peace and love to Earth. Seemingly extreme, these people travel light with no home or possessions. I think about this for a while and wonder if I should join the group. Our short journey ends at another service stop where after 5 minutes I approach a middle-aged couple getting into there large truck. Feeling confident I again ask if they are heading West on the 10, to which I receive a nod of the head. The man asks where I am going to which I reply ‘Anywhere on the West Coast’. A moment of confusion and the man consults his wife. I follow the order and can’t help but laugh as I showcase the majority of my dirty underwear. Tony and Suzanne are heading to Tallahassee, the capital of Florida, to meet with some friends. With my bags in the back of the car, I relax as I listen to their stories. Having 4 kids of their own, we talk mainly of their eldest son who currently serves the US military in Iraq. I can only imagine the tension that they as parents must feel with a son deployed in a hostile military zone. I feel humbled; hitchhiking isn’t dangerous at all when put into perspective. Suzanne, Tony and myself after the customs check of my bag! A lovely couple, the purchase of Harley Davidson is the most recent item to be ticked from their list. Their happiness I am told is derived by a good relationship with God. I tell them about my bizarre encounter with the Penticostal Church which luckily they find funny! I am soon dropped off at Tallahasse where I now write this post. I decided to hit the road at 6am this morning in order to catch the morning traffic heading West from Tallahassee. However after an hour of rejection it was clear I needed a change a plan- enter; Ukulele. Sadly this soon proved just as ineffective as my thumb and so I returned to my motel in an attempt to find someone in the breakfast room heading in my direction- enter; Pirate Pete. Pirate Pete is the nicest madman I’ve ever met. Although 50 something years old, we shared many similar travel tales from backpacking around Europe to playing music and even chasing girls (sadly, Pete had many more stories than me!). He agreed to give me a lift as far as Mobile in Alabama, a further 243 miles down the road, on the condition that we play guitar at the Motel first. Of course I accepted. Apologies for the singing, it sounded better at the time! Pirate Pete is a man with a story, plenty in fact. As cotton fields flew past us as we cruised down the Interstate 10, I learnt of his love of boats (he once sailed across the Atlantic as skipper of a 101ft boat) as well as his love of music (he owns a recording studio). If that’s not enough he has also started a movement that he calls ‘Pray for Peace’. Pray for Peace aims at ridding militants of aggressive behavior so that wars can be solved without conflict. There’s something in that I reckon. Needless to say that Pirate Pete kept me entertained, however after 4 hours (in which he insisted on buying me lunch) we had reached my destination, a quiet rest-stop located next to a swamp in Mobile, Alabama! Thirty minutes of lurking around the car park and a white VW Transporter pulls up. Inside is a heavily bearded man by the name of Mike. Mike, who travels with his dog Millie, looked like the type of person that you would usually see actually hitch hiking, and not picking up hitch hikers but I soon learnt not to judge a book by its cover. Mike, it turns out, lives in his van as he travels around the USA searching for property to build his house on. Mike has been retired for 20 years (that’s right, 20!) due a work related injury he sustained at the age of 22 yrs. Since then, he has travelled the world ticking off items from his list. True travellers of life, Mike and Millie amazed me with confessions of loss, friendship and corruption. So indepth were the stories that I barely noticed us pass over the Mississippi River! Hours of driving had seen the landscape change to one of swamps and bayous. We were now in Louisiana, having passed almost unoticed through Mississippi. As the darkness of night approached, Mike dropped me at Lafayette, Louisiana. In one day I had managed to hitch 496 miles further West with just 2 rides! I am beginning to enjoy this hitchhiking deal! A big thank you of course so far to Pirate Pete, Mike & Millie, Tony and Suzanne, Jaasha, Skip and Sarah- if it wasn’t for you i’d be standing like an idiot in Palm Beach, Florida, 916 miles away! We start todays journey in Lafayette, Louisiana, where I meet Deputy Dink in the motel breakfast room. He quickly offers me a ride, but not quite in the direction I need. A brief run around the nearby truck yard results in no better offers and so I decide to jump in Deputy Dink’s SUV. He was in no way joking. Naturally I jump in the car with a big smile on my face. We leave Lafeyatte and head North West on the 49, heading for Shreveport near the Texas border. It takes us 30 minutes before we literally run out of fuel on the side of the Interstate, and another hour before Jim, one of Deputy Dink’s friends, comes to the rescue. In this time I learn that Deputy Dink not only has a pistol in his pants (insert: ‘are you happy to see me’ joke) but also another hidden under his seat and a shotgun in the boot, making his car both the safest and most dangerous I have travelled in so far. Jim fills us back up with petrol and tells me about ‘Families Helping Families’ a fantastic non-profit organisation that aids individuals with disabilities and their families by empowering them with resources, support and services. Both Jim and Deputy Dink sit on this board! With slow progress on the road thus far I concede that I will not cover much ground today but the company is worth it. Hours later I am ‘deposited’ at the Shreveport Truckstop where under a quickly setting sun, I begin to give up hope on another lift to get me into Texas. Of course only then does Tom enter the gas station hauling a trailer carrying a weird looking machine. We strike up some conversation and after paying for his gas, Tom tells me it’s my lucky day as he throws my bags in his truck. I have scored a lift to Dallas! Tom is in his forties and has travelled the world with his work. If you’ve ever seen the white stripes that designate lanes on the road, well Tom’s machines have probably put them there. He’s painted road-lines in Australia, America, the majority of South America, The Bahamas, China, Europe and even Kuwait! Needless to say he is doing well with business! Tom is also a Vietnam Veteran and goes into detail about his training, missions and perculiar religious encounters. After leaving a bloody Vietnam in the late 70′s, Tom recently re-visited, for the first time, the precise location where he fought. So we ended up travelling 390 miles on the road today, a great surprise after a slow start, and made some great new friends. Texas is a big state so fingers crossed that we make our way at least some way across tomorrow! An early rise this morning is rewarded with a ride straight away with Michael. 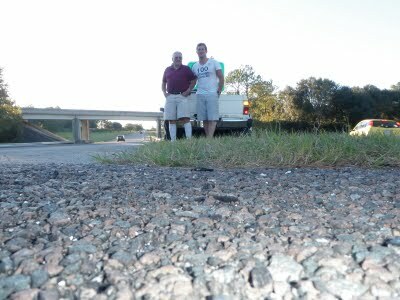 Michael kindly takes me 30 minutes up the road to Fort Worth, a place where hitch hiking is almost impossible! My usual gas station approach is useless in a place where only locals thrive and so I’m forced to walk a mile up the road to the on-ramp to the Interstate 20 where I try and catch drivers headed West for the long haul. Using the cunningness of a gazelle, I create a cardboard sign saying “AUSTRALIAN EXCHANGE STUDENT- HEADED WEST?”. This produces plenty of smiles from passing motorists but eventually attracts the attention of Phil who is kind enough to call me into his pick-up truck. Phil is on his way to pick his son up but after hearing my plight offers to drive me 30 minutes West where a busy truck-stop awaits. Along the way Phil opens up about his recent divorce and the psychological damage that it’s caused him but he smiles everytime he mentions his two kids. Offering me money at the end of our trip (of which I decline of course!) I leave Phil slightly saddened that such a generous guy can be so sad at times. Phil took time from his day just to help me- legend! I’m dropped off next to a massive pick-up truck pulling an even bigger caravan. The man filling it with gas sports a 10-gallon hat and a bright orange shirt which reads “Property of Texas Jail”. Minutes later, after striking up conversation, Mario finishes filling up his vehicle and agrees to give me a lift to Big Springs which sits far West on the 20- perfect! I chuck my bags in the caravan before being treated to a huge breakfast with my new friend, who just happens to be one of the funniest men I’ve met. With what is now becoming an everyday occurrence, Mario shows me his pistol as we pull out of the station and even poses for a photo with it which in hindsight should have worried me more than it did at the time. Mario, a successful pipe welder explains his humble beginnings in Mexico where he once had to find food for his family in the landfills. After showing me a recent pay cheque of his, it’s clear that he has turned around his life and now comfortably supports his wife and three kids. The next child I learn will be called Sebastian. Mario makes me laugh for the next four hours as we joke, sing and discuss life. After traveling for 340 miles we eventually pull up to Big Spring Truck Stop where the car stops 7 metres from the gas pump. For the second time on this hitch hiking journey I have run out of petrol! “Yep, I’m off to El Paso” she replies. El Paso sits a further 344 miles West on the 20, and I cross my fingers as I ask for a lift. This would mean that I would reach the border of Texas and New Mexico ahead of time leaving me only 750 miles from my final destination San Diego on the East Coast! Today, yet again, is my lucky day as she gestures me to jump in. Plenty of character in this old boy! After making sure that Mario is fine, I swap rides like a true professional and properly introduce myself to Pam (the driver) and Sharon (her Mother-in-law). I’m thankful to learn that not everyone in Texas carries a gun, instead Pam soon shows me a double ended hunting knife which she tells me has taken the life of a rattle-snake which once found it’s way into her truck. Looking out the window, this story makes complete sense as cactus plants dot the now enldess desert plains. Occasional wind-farms whizz past now as well. Pam is returning from a truck delivery in Georgia. For 23 years, Pam has been a truck driver and loves it as much today as she ever did. Full of stories, Pam has not only been shot twice (once accidentally by herself! ), but somehow managed once to get robbed three times in the same night whilst walking to her truck in Baltimore! I prey that her luck has changed since then. Pam also proves to be the ultimate tour guide for the recently retired Sharon and myself as she takes us to the Monahan Sand Hills just off the 20 near Odessa. She claims that the sand hills are just like those in the Sahara and is absolutely correct as the setting sun colourfuly illuminates the wind-swept dunes beautifully. Literally sat at the top of a sand dune located in the middle of Texas, I have never ever heard such a deafening silence in my life. Beautiful. After spending 9 or so hours in 4 different cars today, I now sit in El Paso where if I look South I can see the lights of Mexico flickering in the distance. Life is great and there are some amazingly generous people out there. I can feel the East Coast calling! Texas, New Mexico and Arizona are three states that you do not want to be stranded in. Bordering Mexico, this Southern area is infamous for drug trafficking, murder and kidnapping and with one road (the Interstate 10) running from East to West, the long distances between small towns means that a lonely hitch hiker could easily find him or her self stranded. Lucky for me though, I ran into brothers Vern and Bob. Vern and Bob, 76 years old and 65 years old respectively, are road tripping across the USA. It took 2 hours of approaching strangers at the El Paso truck-stop before they arrived in their mid-size RV but thanks to them I find myself writing this in Casa Grande, Arizona, a further 383 miles down the road! Having seen many large RV’s migrating South to find the warmer weather over the last 4 days, I had hoped that I got to ride in one. Needless to say I was over the moon when invited me onboard. Having both served in the US military, the two brothers are now retired after successful careers. At the age of 28, Vern told himself that he would be a millionaire, and now, 49 years on, he sits back in his chair with a sense of accomplishment after achieving this. Being 28 myself, I know that i’ll at least be happy. As we marched Westward on the Interstate 10, I couldn’t help but feel guilty as I reclined on the large couch fixed in the RV’s living room as Vern and Bob concentrated on the road ahead. It did give me a chance however to view two brothers clearly grasping life by the horns and enjoying themselves together as they toured the open road. Laughter often filled the driving cab as hand gestures and pointed fingers act as signals to look out the windows at the unique Southern landscape. Cactus, dairy farms, cowboy ranches, oil refineries and mountain ranges fuse together to create a picture I won’t forget. Very rarely we would pass small gas stations, and I couldn’t help but think how lucky I was sitting in air conditioned comfort of this RV as opposed to standing on the side of the road. I rise out of bed in the morning quickly checking the motel breakfast room for potential rides, if nothing eventuates I walk, backpack in-tow, to the nearest gas station where I hope to catch friendly drivers travelling West. Each rejection or shake of head makes me question myself. At times there will be no-one filling up, and so I decide to walk around the truck-lot. Approaching drivers who stand near their rigs, I’m met with mostly negative responses; “I’m headed East sorry man!” or “I can’t risk my job for you sorry buddy; insurance.” I sometimes wonder if I will ever get out of town and sometimes talk to myself. A lonely car drives into the lot and I approach it locking eyes with the driver in an approachable way; “Are you headed West?” I ask with an exaggerated Australian accent, “Yes, would you like a lift?”, my world is euphoric! This is why I am I am doing this. Life is good and people are caring. We leave Texas and soon find ourselves crossing New Mexico and on into Arizona. We talk indepth about the gun laws in the US and debate the pro’s and con’s. Vern believes we should all carry a gun as protection. If we didn’t, he argues, the criminals would over run us. I argue that we should assertively try and eradicate gun ownership with the goal of creating a gun-free society. I’m told this is unrealistic. I hate guns. On arrival we are immediately invited to join our neighbors for a beer. This is the perfect end to the day of driving and we cheers to new friendship and our neighbor Phil’s birthday. He’s 71 years old today. The cake is delicious and the beer even tastier. Less than 400 miles from San Diego, it looks like Vern and Bob will help me tick off item number 82 tomorrow afternoon as I reach the West Coast of America! Having refrained from ‘farting loudly’ all night, Vern and Bob were gracious enough not to kick me out of their RV first thing in the morning, and so as the sun rose over the Texas mountains at 7am, we rolled out of town headed for San Diego. I share my ideal wedding ceremony where everyone has to dress in costume. I am laughed at for the next five miles. Breakfast on the road- RV style! Having crossed 7 states so far on the journey, we push into the eighth and final state of California. Of course I miss the photo opportunity of the ‘Welcome to California’ sign but the next one tells us that we are less than 200 miles from the West Coast! I peer out the window and genuinely feel sadness in the knowledge that this amazing 6-day adventure is almost over. Each of the 13 rides that it has taken me to reach this point, no matter how long or short, fills me with confidence that people can be generous, compassionate, open and selfless. Fortune has been on my side for 6 days now and of all the fears and concerns of friends and family along the way, I have seen nothing but the goodness of people. Riding with ex military personnel, truck drivers, business owners, inventors, rainbow people, pirates, hippies, deputy sheriffs, divorcees and retirees, each ride creates a mini-confessional where two complete strangers feel a bond of openness that allows a candidness of conversation not often found outside of the car. I have seen tears, heard stories of corruption, given and received advice, and also spoken of things I never thought I would. Religion plays a major part in these Southern states it seems and many of the people I meet pray for my safety. Racism has surfaced only occasionally and gun-law is much talked about by everyone. An awareness of the world and it’s times is also acknowledged by most. Now driving along the Interstate 8, the California road winds through amazing rock formations which soon into turn into huge sand dunes before green fields introduce themselves. One final truck stop to stretch the legs sees that I meet Doug, the Walmart truck driver. Having driven for 10 hours straight, Doug is following strict company policy by resting for 10 hours. He seems glad to talk to someone at this remote stop and before long he takes me to look at his 18-wheeler. I never managed to hitch a ride in one of these trucks and so i’m excited to have a look inside (I feel like a 10-yr old kid!). Minutes down the road, a random border security check liberates Bob and Vern of their stash of Pecan nuts. Amusingly, this infuriates the two brothers. Vern jokingly says that he would have taken the Pecans back and offered me in exchange if given the chance. Again the brothers laugh at me in good nature. San Diego, and the West Coast, quickly rises in front of us and Vern and Bob take me all the way in. The final ride in my journey is all but over and as I shake the hands of two men who yesterday were strangers but today friends, I feel genuine sadness again. Having come to a final stop, I take a step from their RV and breathe in ocean air for the time since leaving Palm Beach Florida, just 6 days ago. I feel alive. I’ve made it and I’m emotional. Apologies to Mario who I forgot to mention in my delirious state! Number 82- Hitch across America… COMPLETE! Thanks to Sarah, Skip, Jaasha, Tony and Suzanne, Pirate Pete, Michael and Mille, deputy Dink and his lovely wide Suzanne, Tom, Michael, Phil, Mario, Deb and Sharon, and of course Vern and Bob! Needless to say without you guys, I would be in a lot of trouble! 100Things… What’s on your list?